I like writing descriptions for my stories about as much as I like eating day old spinach. So! In the best tradition of procrastinators everywhere I decided to write a blog post about how to quickly write a good description. How To Write A Pain-Free Story Description, Quickly. If you outlined your story this process should be relatively pain-free. 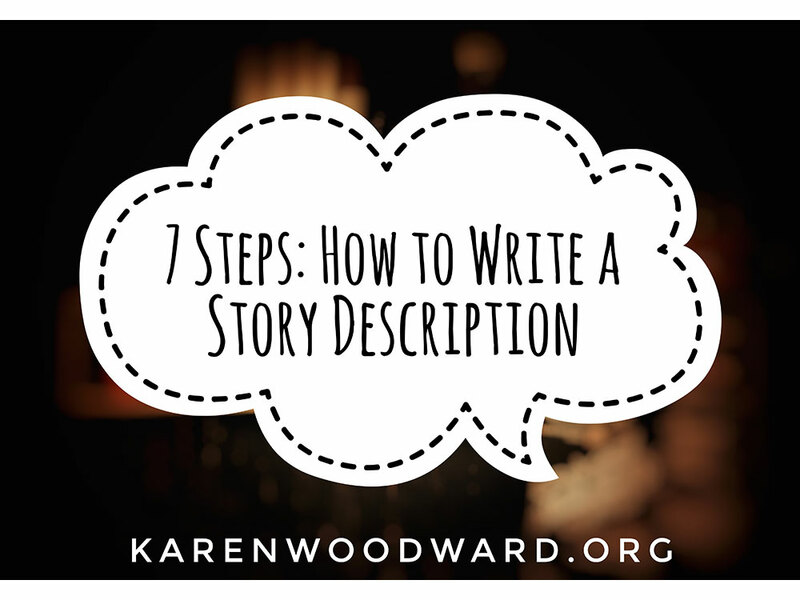 If you didn't outline, answering these questions may help strengthen your story's structure. i. Who is the main character? In J.K. Rowling’s wildly popular children’s story, Harry Potter and the Sorcerer’s Stone, we’re given the main character’s name right in the title! Harry is an orphan who lives with his odious Aunt Petunia, her intolerant husband, and their spoilt child Dudley. ii. What is unique about the main character? What is their special gift? What can they do that no one else is able to? Has their special gift marked them in some way? Harry Potter had been able to mortally injure Voldemort. In Lord of the Rings, only Frodo could carry the One Ring to Mount Doom. In The Girl with the Dragon Tattoo, Stieg Larsson gives Lisbeth Salander elite computer skills, she can do things that none of the other characters in the novel can do. iii. What is the initial setting? As a baby, Harry was left with his obnoxious Aunt Petunia Dursley, Uncle Vernon Dursely and their bratty child Dudley Dursley. Harry is not accepted for who he is and he is constantly reminded that his aunt, uncle and Rodney all hate having him around and wished he would leave. iv. What is the main character’s initial goal? Harry’s initial desire—the thing he wants most when we’re first introduced to the character—is to be part of a family. He desperately wishes his parents weren’t dead, that he was living with them. Or even that he knew more about his parents. Harry, like all of us, wants to find people who accept him for who he really is. v. What person or force opposes the main character achieving his/her initial goal? In Harry’s case, his Aunt, Uncle and their spoilt son Dudley oppose Harry. They are his antagonists, his tormenters. vi. What is the story goal? The story goal is the main character’s overriding goal. Whether the main character will attain the story goal is determined at the climax of the story. Harry Potter’s overriding goal in the first book is to protect the only home/family he has ever known, the Hogwarts School of Witchcraft and Wizardry, from harm. He wants to figure out how Voldemort is endangering the school (and the world in general) and stop him. Specifically, he wants to prevent Voldemort from getting hold of the Philosopher’s Stone and getting back his power. What person or force opposes the main character achieving his/her story goal? Voldemort opposes Harry. Or, to put it another way, it is impossible for both Harry and Voldemort to both achieve their main goals. viii. Positive stakes: If the main character achieves his/her goal what would the consequences be for the main character, the main character’s allies, the antagonist, the antagonist’s allies and the world in general? - Harry: Will be able to stay at the only place he’s ever felt accepted, it’s his only real home. - Voldemort: If Voldemort doesn’t get the Philosopher’s Stone then he won’t be able to get his power back which means he won’t be able to take over the world and remake it in his image. - Harry’s allies: Life can go on as normal. - Voldemort’s allies: Their dreams of attaining wealth and power will be dashed. ix. Negative stakes: If the antagonist achieves his/her goal, what would the consequences be for the main character, the main character’s allies, the antagonist, the antagonist's allies and the world in general? - Harry: Harry would be dead. - Voldemort: Voldemort would, eventually, rule the world and kill billions of people including Muggles. - Voldemort’s allies: Bloated with wealth and power. x. Break into Act Two. What happens, what occurs, to transition, to carry the main character into Act Two? Hagrid arrives to grant Harry one of his wishes: he tells Harry what he really, truly, is—a wizard—and gives him the incredibly welcome news that he will be attending Hogwarts School of Witchcraft and Wizardry in the fall. The school, or rather the people there, become Harry’s new family and give him the sense of belonging he sought. xi. The Special World of the Adventure. Hogwarts school of Witchcraft and Wizardry. Harry Potter discovers he’s a wizard and that he has been accepted into a school created just for people like him. Not only will he fit in, he is regarded as something of a hero. Voldemort is attempting to get his power back. If he does he will destroy the entire world, Harry and Hogwarts included. While in the Special World of the Adventure, the main character learns about his parents and himself. He discovered how his parents died, why and how he came to live with the Dursleys, why he has the scar he does, and Ron Wesley’s family accepts him. Okay! You will notice that not all of the above points directly contribute to the description, but they help lay out the essential structure of the story, it’s backbone. By this time you should have one or two sentence descriptions for each of the above points. Now let’s knit this information together into a description. (Not each and every point will be used, but they allow us to double-check that our story is well-formed.) By the way, I’ve taken this particular description from the publisher’s book page. Complication/Antagonist/Pinch Point: “But an evil power is rising, the same one that threatened to destroy the entire world when Harry was only a baby.